My third recent Bravesword review is Lee Hyun IL Signature model, a racquet I’ve really been looking forward to reviewing following an initial test in Germany in July. Generally speaking I’m not a great fan of signature racquets because the name can sometimes get in the way in respect of whether the racquet’s any good or not, or whether it suits your game. What makes this racquet so quirky is that Lee Hyun IL has retired from international badminton twice and no disrespect to the player, but not too many European players, especially at club level will have any idea who he is and what a good player he was. So why introduce it now? Why not choose an up and coming badminton star? Lee Hyun IL was a Korean singles player (semi finalist at 2012 Olympics) who favoured Bravesword 11 during his last few years of international competition. It’s no surprise therefore that the specifications on this racquet are identical to Bravesword 11 i.e. medium stiff flex and even balance head. This Bravesword LHI is a sample and therefore the bag was not included. I am aware there is a full length cover to accompany the racquet and no doubt it will be Victor’s high quality, possibly a blue version of LYD cover. This is a great looking badminton racquet with silver specked black paint, white gold, yellow and blue decals which add so much to the overall look of the racquet – my first WOW! of the day. Victor has a rating system for shaft flexibility and head weight. BS LHI scores 4/5 for shaft flexibility which translates to medium-stiff performance and 3/5 for head weight which means even balance although I detect a leaning towards head heavy here. Weight is 3U (84-89g) and grip size is G5 which makes me wonder whether it’s close to a Yonex G5 although doesn’t feel that thin. All top-end Victor racquets arrive unstrung, so this particular model was strung by me as it’s a sample and not for the retailer. So I strung it to 27lbs with Victor’s VS850 string. It’s a very nice string although tends to lose tension early which is a shame as it plays so beautifully. Maximum tension for this racquet is 30lbs so there’s plenty more in the tank to cover the majority of county and international players preferences. I’ve said before that the great thing about even balance badminton racquets is that they tend to do many things very well. Quite frankly this is an understatement in respect of this particular racquet. Readers of my blog have heard so many times about my particular preference for head heavy racquets. 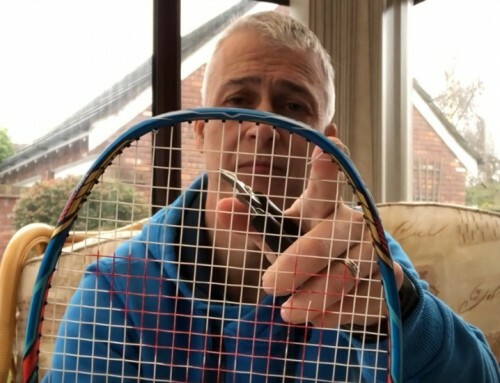 Having recently tested and liked Bravesword 12 which was an even balance racquet, which I customised by adding Victor’s Powerizer tape, I expected to be taking similar action with this particular racquet, but it wasn’t required. Perhaps I was right and there is an element of head heaviness here. With a wet BP of around 307mm it’s certainly leaning towards head heavy. First impressions were extremely good with this racquet. I expected the usual fast frame from a Bravesword but this racquet really came alive. Clears were so crisp and easy. The stiffer shaft gave this racquet a little more substance in the shot which I really enjoyed. This is the feel I would have liked in LYD version but didn’t get. So thumbs up in the clearing department and a second thumbs up when slicing, reverse slicing and testing a number of drop shots from rear court. I really like the speed of this frame, and the sharpness of the shot. Granted it doesn’t possess the most solid platform in the head compared to the best (Z Force), but there again, no racquet has matched it either. My smashes were pretty good too. For me I accept that I need a head heavy racquet for my best, but at my age I fatigue quicker, especially with the lack of playing and fitness so I was delighted with the results I achieved in the three hours on court. And I was still smashing stronger with control at the end. Box ticked. Perhaps I had the added benefit of testing a racquet at my preferred tension for once but was thoroughly enjoying this review. Having moved on from the flat exchanges and saw a marked improvement in defence. The speed of frame really came into play here and I snapped a number of really good off the hip shots so much better. Bravesword Lee Hyun IL allowed me to be even more aggressive at the net which was great fun. I agree that the increased tension provided so much more control. The smaller grip really suited and allowed for fast grip change and the standard Bravesword racquet speed did the rest – lovely. The Victor Bravesword Lee Hyun IL is a superb racquet and for me goes one better than BS12. Perhaps this is because it’s more suited to my preferences although generally I wouldn’t choose an even balance racquet over head heavy. Of course, there’s the added benefit of a custom restring so I was playing close to my usual preferences albeit a different string (which I might add played so well). I’ve stated on many occasions on how I enjoy Victor Bravesword series. It’s a shame there are not more frames in this range with a lower price point because I consider they will be extremely successful. 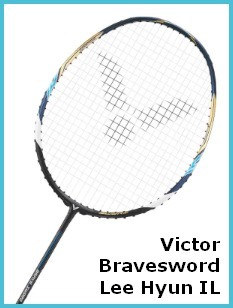 Victor’s Bravesword 10 was my first 5 star rated non-Yonex racquet. Whilst the specs on the BS LHI are slightly different, overall playability was up there and at the very top. This racquet has great looks, great feel and great playability. Sadly I cannot compare to the old BS10 for a head to head review however, I am so impressed with this racquet that it is my racquet of choice for the forthcoming season. To give a racquet such an accolade is unusual for me and therefore I have to back this up by awarding Bravesword Lee Hyun IL a five star rating. Forget this racquet is badged a signature racquet. It stands on its own merits and well deserves it – another World Class racquet from Victor. Look out for an opportunity to demo one and maybe you’ll be as pleased with it as I am. Thank you for the nice review. I’m thinking of getting this racket, but I’m deciding whether I should get a 3U or 4U. Which one would you recommend? What are the pros and cons of choosing 3U/4U? With Bravesword rackets I suggest you go for the 3U version. The difference between 3 and 4U can be marginal and vast. 4U is a weightig of 80-84g whereas 3U is 85-89g. In essence you could have two rackets with 1g difference which you most likely not notice, or there could be 9g difference which you would feel. Go with the 3U – the racket is still light and fast. It’s okay coach, thanks for reply anyway. Just another question, does this racquet smash better than ArcSaber 11? And well if compared to ArcSaber 11, what are the major difference? Just need a rough comparison. Thanks in advance. Not necessarily better, just different. At the end of the day you may find you hit harder because the frame is faster, but that’s the personal aspect nobody can predict. Aside from that I’ve already answered the question of differences between these rackets a number of times in the last week or so. Your reviews are great! 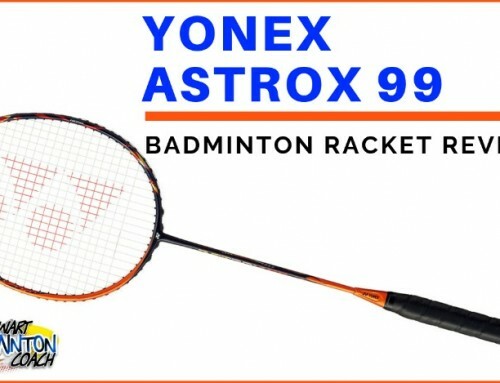 May I ask you for a comparison between this racquet and Yonex Nanospeed 9000X? 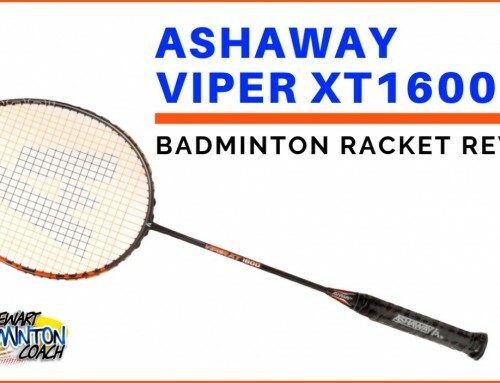 I m thinking of buying one new racquet but not sure whether this one will suits me, or Yonex Arcsaber 11 better for me? Thanks Coach. I’d love to give you a comparison but it’s been so long since I tested Nanospeed rackets, I really can’t remember anything about 9000. Sorry about that. 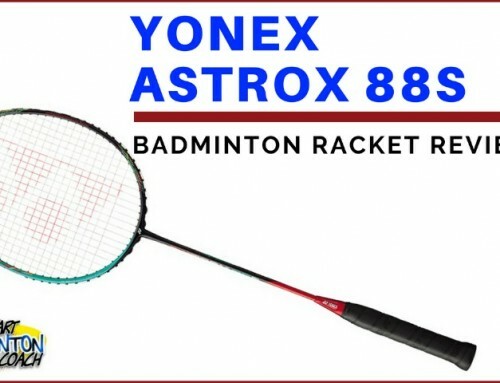 I’ve noticed that you’ve reviewed quite a lot of rackets from the Bravesword series, though I wonder, are any of the technology like the shock less grommets just advertisement or are they actually putting some effect on the rackets performance? I don’t believe any of the marketing from the racket manufacturers. I play with a racket and note how it feels in my hands and what it does well or consistently. The rest is pure hype although occasionally something comes along that is true and works well. Shockless grommets have been tried many times in different guises. I don’t believe they will make much difference and would certaainly not pay any attention to them. Can you compare the LHI’s play directly to the Brave Sword 12 in terms of weight balance? Given that the Brave Sword 12 plays like the majority of the weight is at the T-joint it feels different than the 10, 12 or LYD. Does the LHI have the feel of the BS12 or does it feel more like the 10? LHI fits between BS10 and 12. It’s stiffer than the 12 but not quite as stiff as a 10. Headweight is similar to a 10 although it may be slightly heavier. I don’t have a 10 to compare. LYD has more head mass and with the slightly longer shaft, the flex point is different and for me makes the shaft feel more flexible than it’s spec suggests. All of these rackets are very good and you can always use the Powerizer to customise by adding weight in the head. Trying to find a backup or replacement racket for my Carlton Fireblade Tour and this seems to be quite a close match. My wife bought me a voltric 80 for my birthday (my first head heavy racket) and i was over the moon but it just didnt feel comfortable to play with. I had it restrung to my usual string and poundage but still just didnt feel right, shame really cause its a lovely looking racket and had improved my smash. luckily its a popular racket down at my club so shouldnt find it hard to get rid off. Uou should also test Meteor JJS. My review will go live in a week or so. I was amazed how well it played, it really took me by surprise. i was wondering if anyone new if this was for sale in the uk yet. cant seem to find it anywhere. It’s due in Europe within the next 2 weeks so allow a further week before it’s available in UK. LHI is an amazing player. He and TMN of Vietnam are totally underrated but very entertaining to watch their physicality and drive to keep going…. I like how this racket looks and actually quite liked my BS12 and may pick one up at some point. I look forward to giving this a go! Its a shame more people wouldn’t know Lee Hyun Il though, as he is one of the best mens singles players of the last 10 years. Truly top quality! Hopefully you will have this racket in the bag at Lilleshall? 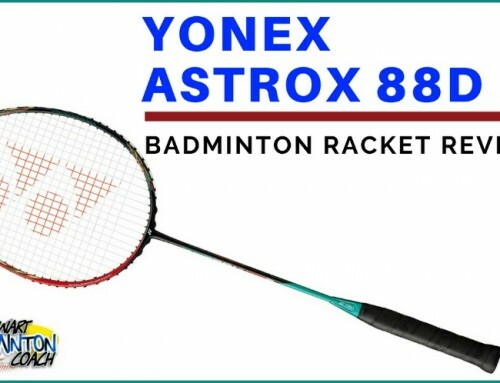 How do you compare this racket with ones of your fav in the past, mx 60/vt 80? I bought mx 60 4u after I read your review. I am glad I did. Before that I also bought vt 80 4u but I prefer mx 60. I wish you can also review tk 8000 and compare it to mx 60/vt 80. Thanks. Thruster 8000 review is virtually done. I have so much to post on my blog but need to give each article time. I’ve still to return to my series on tactics and will be giving that some serious thought and time next week. Nice review as usual. How much do you think the custom stringing at 27lbs contributed to you liking the LHI? Something tells me that you may have a different opinion of the LYD at similar tension as well! This racket really was a surprise although having played a game with it in Germany I knew i already liked it. What surprised me most was that I didn’t need the added weight which is usally the first thing I miss. i felt it had enough. And, for an even balance racket that shocked me. LYD has more head mass and a longer shaft by 1cm. This has an effect on playability. Whilst it’s still very quick and plays well, I felt it was too flexible. i hear LYD own racket is stiffer which makes sense. I felt that LYD would be faster and more solid if they had stiffened it up more. So LYD would not be my personal choice. With regard to your comment on tension. Outside forces played a part here as the racket did not belong to my retailer. Did it make that much difference? I’m sure it played some part but overall the feel of the racket isn’t based on string tension, but on balance in your hand and how the racket moves with you. So from that perspective, tension did not play a part at all. However, the crispness of the shot and control were improved a little, but again the feeling was there, and this is where skill comes into play a little. Sorry i didn’t post Thruster 8000 review as was anticipated. But having played with this racket I just had to get this review finished and out.